We were spoiled last year. It was a spring and a fall even fortunate farmers seldom experience in a lifetime. Warm and dry enough very early on, enough to plant everything two weeks to a month ahead of time – then warm and dry well into the fall, making for a pleasant harvest. This spring’s wide swings in weather remind us what thousands of scientists have been predicting for years regarding climate change. Three times in late May and early June, we had frost or threat of it, followed by 90 or near-90-degree temperatures. June is typically about 78 F. My truck thermometer showed an outside temperature of 102 F last Wednesday. Bursts of heat, and yet not enough sun this spring. So many cloudy days have kept some of our plants from maturing. Our high tunnel greenhouses helped us get some crops growing early. A number of plants (tomatoes, cucumbers, snow peas, etc.) are flowering. Some are close to yielding in bountiful quantities but not quite yet. We’re doing the best we can with what Mother Nature and our planet allow. Storm damage – last week’s hurricane-force winds knocked our power out for about 24 hours. The Wednesday night storm ripped the plastic off the high tunnel we constructed in 2008. It brought down a black locust tree limb precariously over one of our greenhouse entryways. The day after, we began at dawn to reconstruct the 72-foot high tunnel and to remove the fallen tree. As always, Joy, our agricultural intern from Dordt College in Iowa, and Sarah, an Ameri-Corps volunteer who’s spending two days a week here, pitched into help. Son Joel and daughter Holly have been terrific help this week, too. I arrived on the scene very early Thursday morning after jack-knifed semi trucks closed the Interstate highway during the storm. I pulled into an oasis on the Kennedy Expressway after farmers market and deliveries in the Chicago area. I slept through the storm in my pickup. It doesn’t take a storm, however, to give us long lists of things needing to be done. Volunteer help on your farm is always welcome. We try to keep Sunday as a day when Dela and I can work together at a little slower pace after church, survey progress and plan courses of action for all our helpers. 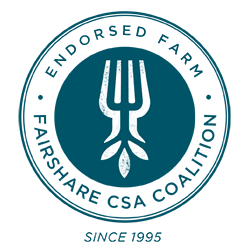 Almost any other day, we can find useful contributions you can make to support our community and our organic agricultural practices. Call or email us in advance to let us know when to expect you (dela@scotchhillfarm.com / 608 897-4288) Packaging – We transport fresh produce in ¾ bushel waxed boxes. They cost us $2 each. If we used one per subscriber per week, ten percent of our gross income would just about go totally to packaging. We drove to a warehouse in Baraboo 4 years ago to get them in quantity. And by including donated brown paper grocery bags in each box, we’ve made these boxes last and last. Please, please bring as many of them to us at delivery points as you possibly can. This is the first time in 17 years we’ve included rhubarb in a weekly subscription. You can thank the weather for delaying the crop this year and the calendar rotation for a somewhat earlier delivery schedule. My mother, whose heritage turned from farming to steel working in the early part of the last century, loved to reminisce over simpler times with dishes like stewed rhubarb (a kind of tart applesauce), often for breakfast. Following is from Susan Herrmann Loomis great Farmhouse Cookbook, 1991, Workman Publishing, a compilation from small farms, ranches, dairies, vineyards and orchards of America. You can substitute berries, apples, or mixed fruit of your choice. Step 2: Place 1 ½ cup rolled oats, ¾ cup sifted all-purpose flour and 1 ½ cup lightly packed light brown sugar in a food processor. Process briefly to blend the mixture. Add 12 tablespoons (1 ½ sticks) unsalted butter and process until the ingredients are mixed. Be careful not to over-mix. You want to keep the texture of the oats. The mixture will be somewhat dusty looking. Step 3: In a medium-sized bowl, toss 4 ½ cups diced rhubarb, 2 more tablespoons flour, ¼ cup granulated sugar (or a natural substitute of your choice), 1 ½ teaspoons ground cinnamon, ¼ teaspoon salt, and 2 tablespoons water until well mixed. Step 4: place the rhubarb mixture in an 8-inch square non-reactive earthenware or glass pan. Cover it with the oat topping, patting it gently into place. Bake until the fruit is bubbling up around the edges and the topping is golden and crisp, about 45 minutes. Serves 6.